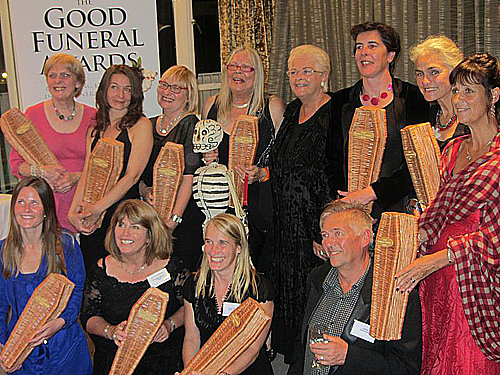 At this year’s Good Funeral Awards, which took place on Saturday 7th September in Bournemouth, Henley Woodland Burial Ground won the much coveted ‘Cemetery of the Year’ award. This triumph reflects the increasing popularity of natural burials and the public’s efforts to find more meaningful, discerning alternatives to crematoriums and municipal cemeteries. Nominations were submitted by customers, whose experiences were read, scrutinised and judged by an anonymous panel of funeral experts. The cemeteries, which ranged from Victorian graveyards to the ‘go natural’ woodland and meadow burial grounds, had both their appearance and customer service reputation taken into account, with Henley’s simple, natural ethos edging ahead of the stiff competition. There to receive the award for Henley was Melissa Stewart, collecting the miniature wicker coffin trophy from host Pam St. Clement aka Eastenders’ infamous Pat Butcher. Melissa summed up the weekend by saying “It was great to spend a whole weekend with people who share the same vision. Our mutual purpose is to make people’s experiences of death, dying, funerals and bereavement change for the better and we spark off each other.” A Q&A followed the awards presentation, in which the audience were encouraged to ask Pam about her death bed performance. Unlike the teary TV scene however, there was no lack of words as the hostess gave a rousing account of how she undertook her final goodbye, and shared her own thoughts on death, dying and bereavement. The award ceremony capped off a weekend of all things death that was organised by Brian Jenner and ‘The Good Funeral Guide’s’ Charles Cowling. Also featured in the programme was the Death Café’s welcome – ‘where people come together in a relaxed and safe setting to discuss death, drink tea and eat cake’; the unveiling of a new pebble shaped coffin in which the person who has died lies in the foetal position; and lectures which included Pia Interlandi’s ‘Garments for the Grave’. Henley Woodland Burial Ground, one of Leedam Natural Heritage’s seven sites across the UK, attributes their success to their custodian Andrea Chanter. As the customers’ accounts confirm, her personal guidance and honest and friendly support makes the funeral experience far gentler and more manageable for grieving families. This, coupled with Leedam’s commitment to minimise its impact on the countryside, ensured that the prize went to Henley. The awards presentation was filmed by ITV, broadcast date to be announced.